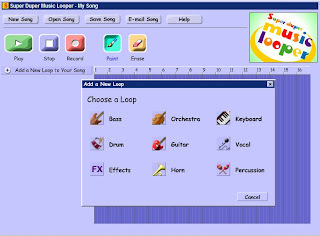 Super Duper Music Looper is a web tool that created by Sony Software. This web tool lets you to use some materials to create a simple music, it looks like use a paint pen. It is simple, it is fun. First step is click "Add a new loop to your song", it will open a window that lets you choose a loop, like Bass, Drum, Guitar, Orchestra, Vocal, Keyboard. 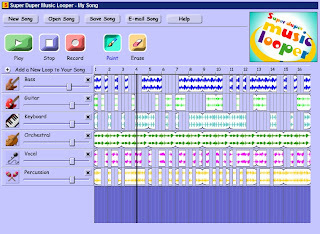 You can add more loops, each time you added you can play it for listening, then you can use paint pen paint on music line. After you done, you can listen it. It based on flash platform, so it is easy to change your creation. But you can not record it, that function only for paid user.